The life of this thirteenth century “Apostle of the North,” known for his zeal for souls, makes him a great patron for our modern times, so much in need of young hearts fearlessly leaving all to proclaim the Gospel. 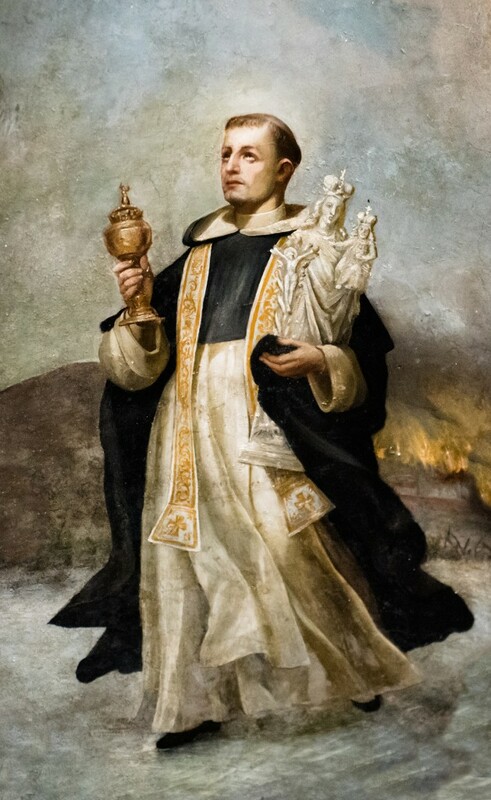 Zeal such as that of St. Hyacinth is the driving force of the Order of Preachers. If we consider the Greek etymology of the word “enthusiasm,” which means “to be full of God,” Hyacinth comes across as a figure unconditional in his enthusiasm for preaching the Good News. Born of noble parents in Poland around 1185, he was educated in Cracow. On a trip to Rome in 1218, he met St. Dominic, from whom both Hyacinth and his cousin, Ceslaus, received the habit of the Friars Preachers. A painting at the Dominican Church of Santa Sabina in Rome depicts this event with Ceslaus lying prostrate on the floor and Hyacinth being clothed by St. Dominic in the white robe of “the athletes of the faith.” Within a few months of his reception of the habit, Hyacinth embarked on his first mission, sent by St. Dominic to preach and establish the Order in Poland. For the next 35 years, this great disciple of Dominic devoted himself to preaching the Gospel, encouraging his followers to nurture the practice of study, and opening new Dominican monasteries. He was tireless in his efforts, soon establishing Dominican Friaries in all the major cities in Poland. These houses became known as centers of theological thought and missionary activity. He extended his missionary activity through Russia, Lithuania, present day Czech Republic and Slovakia, Austria, Bohemia, Greece, Turkey and northern China. After crossing the Baltic Sea, he preached in Denmark, Sweden, and Norway and is also said to have visited Scotland. After unceasing labors and vast journeys, Hyacinth spent his last few months of life in a monastery he had founded in Cracow. Although worn out and weakened by illness and fever, he kept watch in the service of God until his death by celebrating Mass on the Feast of the Assumption. He was anointed at the foot of the altar on August 15, 1257 and died the same day. Canonized over 300 years later, he was the seventh Dominican to be raised to sainthood. How can we relate to this saint today and call on him to watch over re-evangelization efforts carried out by the followers of Christ around the world? The answer lies in Hyacinth’s fidelity to the charism of St. Dominic. This Polish Dominican responded without hesitation to the personal call of Christ, re-echoed centuries later by St. John Paul II in the words, duc in altum (cast out into the deep). Hyacinth followed Christ with all the idealism and fervor of his youth. With trust, Hyacinth put the little he had into the hands of the Lord, who blessed and multiplied his offering, feeding the thousands who were converted, baptized, re-evangelized or inspired to join the Order of Preachers. The flame that set the heart of this “Polish St. Dominic” on fire to preach the Truth is still burning. That flame is the Person of Jesus Christ, searching for those who will give their lives for the Gospel in this “springtime of evangelization.” In 1957 the Polish Dominican Provincial remarked that strong devotion to St. Hyacinth was always followed by renewed activity and spiritual fervor among the Polish Dominicans, while a weakening in this filial dependence on his intercession invariably resulted in a far less energetic spirit among the brethren. From his place on the Bernini colonnade at St. Peter’s, Hyacinth urges us to assume our place in the glorious mission to spread the Kingdom of God.